Al Ferof has been ruled out for the next few months, trainer Paul Nicholls has confirmed. 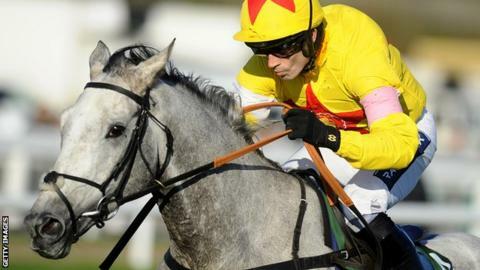 The 10-year-old grey needs surgery on an entrapped epiglottis and will miss intended races at Ascot this weekend and March's Cheltenham Festival. In his Betfair column, champion trainer Nicholls said he would be now be entering top-class novice Ptit Zig for Saturday's Ascot Chase. Al Ferof is expected to be ready for Aintree and Punchestown in April. Ridden by Sam Twiston-Davies, he finished third in the King George VI chase behind stablemate Silviniaco Conti at Kempton on Boxing Day. Al Ferof had been fifth favourite for the Queen Mother Champion Chase at Cheltenham, and had the Ryanair Chase at the meeting as a potential alternative.